An index to the imperial Spezialkarte. Source: Staatsbibliothek zu Berlin. 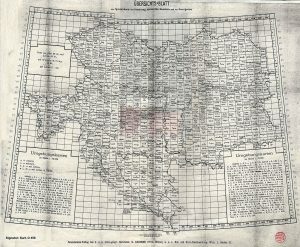 Perhaps the most famous and most widely-used map of the Austro-Hungarian Empire was the late imperial Spezialkarte der Osterreichisch-Ungarischen Monarchie series, first published by the K.u.K. Militärgeographisches Institut in 1877 and maintained with updates until the outbreak of the Great War. Designed at 1:75,000 scale, the scope of the work was enormous, covering the entire Empire in more than 750 sheets, each about 55cm by 38cm (22 in. by 15 in.). The maps were monochromatic but highly detailed, with a large variety of natural and built features and a simplified representation of topography. An assembly of the paper maps of the entire Empire would cover an area about 18m by 13m (about 60 ft by 40 ft). Rohatyn appears in the map of zone 8, column XXXI from the online collection of the WIG Map Archive, which includes the towns of Bursztyn, Stratyn, and Bukaczowce. 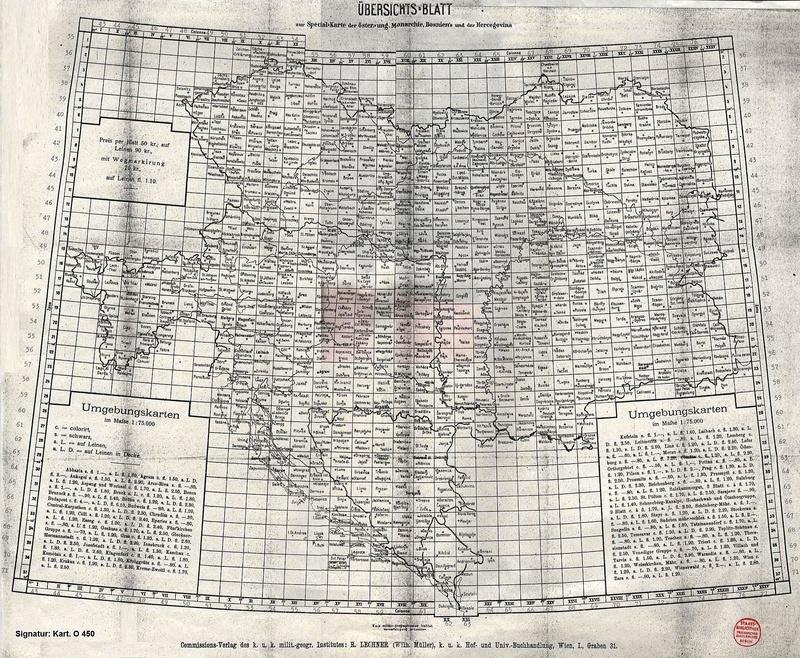 For a study of the 1880 geography of the Rohatyn district for the Rohatyn Shtetl Research Group, we created a digital composite of portions of four sheets comprising zones 8 and 9, and columns XXXI and XXXII, spanning Chodorów to Brzeżany to Halicz. That composite is the image presented here in an overlay on Bing Maps satellite data from the contemporary town. The image is interactive: pan and zoom are available with ordinary mouse controls or gestures, depending on the device, and zoom is also available by the +/- buttons in the upper left of the display. The map can be made transparent in 10 steps by sliding the control in the upper right of the image. This 1880 regional map is one of a series of historical map overlays included in the project Mapping Rohatyn: Geography as an Education Resource.